The requirement of every wetroom and shower area. Tile Backer Board is essential to all installations, As odd as it sounds it saves you money, the only waterproofing of the area is the joints, This not only provide a nice clean surface for tiling, but Tile Backer Boards are waterproof as well saving installation time costs. Tile Backer Boards come in multiple thicknesses and can be used on floors and walls, They are compatible with underfloor heating and support multiple tile formats. What are the benefits of Tile Backer Board? Jackoboard Tile Backer Board comes in multiple sizes that is easy to cut and can be used for all different types of application including Underfloor Heating Insulation and Wetroom Backer Boards. Engineered and manufactured in Germany to the highest of standards including ISO:9001 and ISO:14001 these tile backer boards have excellent thermal properties and loading capacities which separate them from many other tile backer board manufacturers. 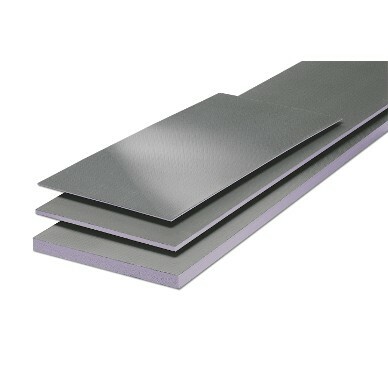 What are Jackoboard tiling boards made of? Each tiling board is manufactured with an XPS Core which is waterproof and is finished with a flexible mortar face. Installing and using tiling boards in wetrooms is not only cost effective, but the industry standard, once the tiling board has been installed correctly and sealed with sealing tape the wet area is fully waterproof ensuring peace of mind that no leaks appear. With outstanding thermal properties Jackoboard tile backing boards can be utilised with underfloor heating ensuing super quick heat up times and retention of heat within the room.